Arroll's Parisian 560mm Cast Iron Radiators are sleek and stylish, suiting contemporary interior design, loft living and modern apartments. These small cast iron radiators look particularly stylish when highlight polished. 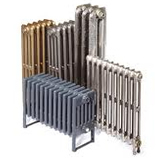 All cast iron radiators are delivered to you fully assembled and tested in accordance with the appropriate British standard with a full 10 year guarantee to ensure peace of mind for years to come. Arroll Cast Iron Radiators look fantastic when full polished, Satin Polished or highlight polished. 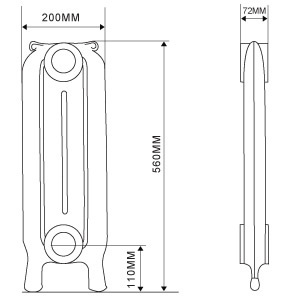 Alternatively, Arroll Cast Ion Radiators are available painted in any colour - our popular colours are detailed below. Orders can be placed online or you are welcome to call our friendly staff on 01723 321333 who will be happy to assist you. Delivery is made using a pallet service, the average delivery time is subject to your choice of finish and can vary depending upon time of year.